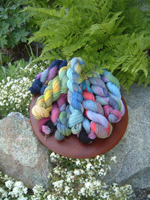 Guild membership is open to anyone interested in weaving, spinning and other fiber arts. Two types of membership are available: Active $45/year and subscribing (newsletter only) $10/year. You can register in person at a monthly meeting, by mail or online below. New for the Sept 2018 – Aug 2019 guild year, enroll or renew online, with the option to either pay online via PayPal links or send us a check if you prefer. Please click HERE to enroll or renew. Have first priority for space in workshops. Be notified of workshops through the newsletter.